If most books about the military in war concentrate on the description and analysis of direct combat and combat-related activities, Nathan Wise takes a different tack in his book Anzac Labour. 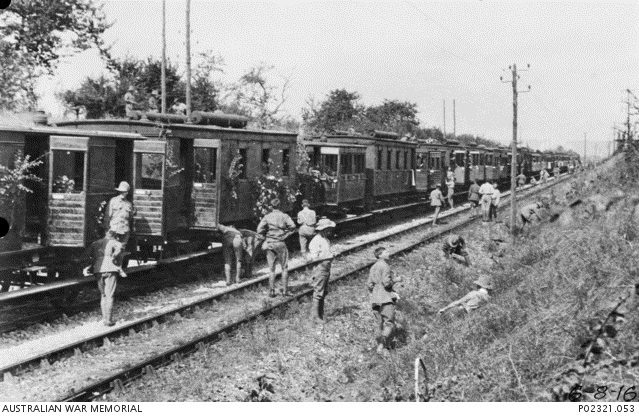 He looks at the experiences of members of the Australian Imperial Force (AIF) in World War I from recruitment through training, waiting around, travel from Australia and back, combat and its many support activities close to and removed from the front, right through to redundancy at the war’s end. Everything, he says, ‘from peeling potatoes, through to intense and deadly involvement in large scale military offensives’. Wise wants to know ‘how men came to approach and to understand their military service as a job of work’. He says that ‘one of the most common ways in which soldiers attempted to understand and rationalize their environment’ was to write about it in letters and diaries. So, while he is aware of the limitations of these sources, including the limitations arising from the censorship of letters, Wise salts his book with extracts from this material and builds a fascinating picture of the ways in which soldiers saw and understand what they were in for. The book’s sections deal with the building up of the AIF in Australia, then embarkation, the experiences (if that’s not too light a word) in Gallipoli, the Western Front and the Near East, life after the armistice, the drawn-out return to Australia and civilian life again. As we fret nowadays about domestic and international security, it’s worth remembering the scale of World War I for Australia. From a population of 5 million, some 416 000 enlisted, 330 000 embarked, more than 60 000 died and many more were left with physical and mental injuries that would dog them for the rest of their lives. In absolute and relative terms this may be the worst thing this country has ever suffered. Wise’s attempt to bring to light and better appreciate the all-round experience of those most intimately involved is wholly worthwhile history. The motivations for enlisting were a mixture of duty to the British Empire (when a young Australia didn’t have an independent foreign policy), generous pay by community standards, the chance of a ‘Free tour to Great Britain and Europe’, as a recruitment brochure claimed, and military adventure, as opposed to the regularity of civilian employment. Unsurprisingly, many men brought with them expectations developed from their pre-enlistment work lives. Wise says that ‘the AIF resembled a recalcitrant workforce struggling to live with their new and over bearing workplace rules’, in which they wished to have some say. When training hours were increased in the Casula and Liverpool camps military police fired on protesting troops at Central Station in Sydney, killing one and wounding others. Subsequent drunkenness and rioting, Wise says, ‘has been remembered as a catalyst for “early closing” of public houses’. Snipers shot fifteen Aussies this morning and shrapnel got four of our regimental AMC men. It’s heartbreaking to see so many men killed and maimed when they are not in the actual firing line. No matter on what peaceful errand we go, death goes too. We never know whether we will wake up alive. 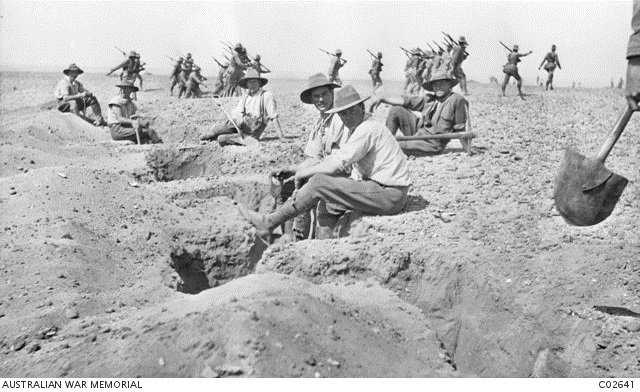 Considering the Western Front, Wise points to the large amount of time Australian soldiers spent not in fighting but in manual labour. From a diary, Wise calculates that, over a 27 month period, Francis Addy, who was in the 4th Battalion of the AIF, spent 12 per cent of his time in the front lines and more than 60 per cent behind the lines. This, he says, is consistent with J G Fuller’s estimates that two-fifths of the British and Dominion soldiers’ experience of military service was spent in the trenches, even less on the front lines. That is to say, notwithstanding the colossal loss of life and injury on the Western Front, the day-to-day experience of soldiers was taken up with large amounts of behind-the-lines time, which ‘came in many ways to resemble their work as civilians’. In the Near East after Gallipoli the days of those with the Light Horse and the Camel Corps were filled with long periods of tedium. In a letter in August 1916 James Love says, ‘Our job here goes on in monotonous routine, feeding, grooming, and watering camels, loafing in camp when not out on patrol, and impatiently waiting for the time to make our dash’. Later in the War those chances came at the cost of many lives and Wise says that, for those involved here, ‘their daily work … closely resembled the work undertaken by Australian soldiers in trenches of Gallipoli and the Western Front’. With the Armistice, Wise says ‘the expected sense of overwhelming joy failed to materialize’. Henry Dadswell wrote that ‘an officer came out. “Boys you’ve lost your jobs. The war’s over and you can all go back to your billets.” The men just stood quiet and looked at one another as if they couldn’t take it in.’ The need for their work was gone and now they had to pack up and get on with the long slow business of returning home. They were on a slow trip to finding new jobs in a country badly affected by the war. In a perverse sense maybe not a lot to be cheery about for many whose life’s purpose for four years had been largely defined by military work. If we are to truly understand the significance of the experience of war, we need to begin to place the lives of soldiers within a broader historical context, cast aside the historical obsession with combat and consider the history of work within the military. Wise’s book is well written and put together. It is well-researched and referenced and it is made vivid through the on-the-spot, contemporary observations of Great War soldiers. Paddy Gourley is a superannuated Commonwealth official who worked in the Department of Defence for ten years. He had extensive experience in employment matters.